"Whosoever relieves from a believer some grief pertaining to this world, Allah will relieve from him some grief pertaining to the Hereafter. 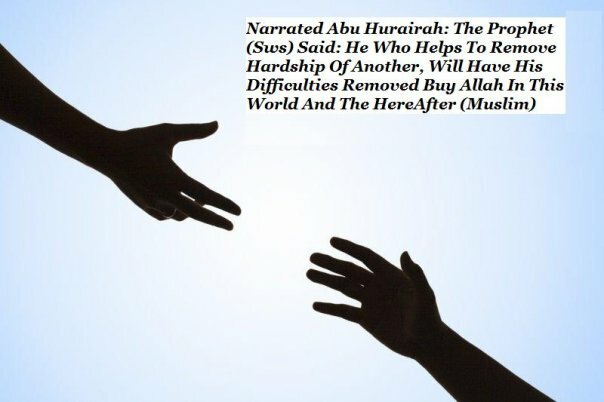 Whosoever alleviates the difficulties of a needy person who cannot pay his debt, Allah will alleviate his difficulties in both this world and the Hereafter. Whosoever conceals the faults of a Muslim, Allah will conceal his faults in this world and the Hereafter. Allah will aid a servant (of His) so long as the servant aids his brother. Whosoever follows a path to seek knowledge therein, Allah will make easy for him a path to Paradise. No people gather together in one of the houses of Allah, reciting the Book of Allah and studying it among themselves, except that tranquility descends upon them, mercy covers them, the angels surround them, and Allah makes mention of them amongst those who are in His presence. Whosoever is slowed down by his deeds will not be hastened forward by his lineage." 19:96. Verily, those who believe [in the Oneness of Allah and in His Messenger (Muhammad )] and work deeds of righteousness, the Most Beneficent (Allah) will bestow love for them (in the hearts of the believers).